Birders who have just taken up Birdwatching. Birders who need a little extra help with identification & planing birding days out. Families and day trippers enjoying a day out. The aim of the guides is to get the most fun, enjoyment and information out of your trip. So how do they work? Well the concept is simple. 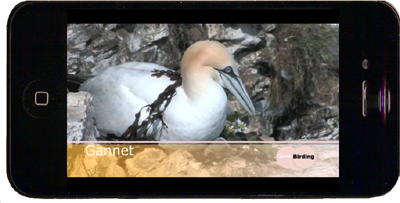 After purchasing the disc for the site you are visiting, and copying it across to your device via iTunes, you play the videos for each of the ViewPoints whilst actually visiting the reserve. There's an introduction with background information on the reserve, including facilities and how to get there etc... There's a map showing the best places to visit on the reserve (ViewPoints) and a video for each ViewPoint. You then play the video at each ViewPoint as identified on the map as you follow the route laid out. Each ViewPoint video explains where to look, what you can expect to see and how to identify the birds you are seeing. When you reach the next viewpoint, you play the next video, and so on. It's like walking around with an expert by your side. 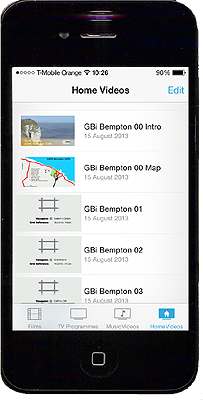 Initially we have GBi RSPB Bempton Cliffs. Other titles will follow. Versions for non Apple products will come as we develop these products. 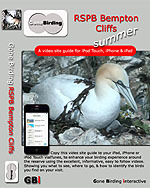 From Grandstand viewpoint to Staple Newk, via Jubilee Corner and the Dell, this video will explain where to go and what you'll see during a summer visit to RSPB Bempton Cliffs, where over 200,000 seabirds breed, including the UK's only mainland Gannetry. From locating and identifying Puffins, separating Razorbill & Guillemot to ageing Gannets, this video will enable you make the most from your visit to Bempton Cliffs. 1). eBay- if you have an eBay and PayPal account click on the eBay buy me button above. 2). Cheque- send a cheque for £6.50 (inc. p+p) payable to "A Hirst" to 5 Ruston Close, Chesterfield, S40 4RY. (cheaper method). 3). Bank Transfer- email or phone us for our account details so you can transfer the money swiftly and easily online (cheapest method). Trade orders welcome- payment initially via pro-forma invoice. Orders dispatched within 24 hours of order receipt.